Digital Electronics can quickly become an expensive hobby, but to get started, you need to spend only a few bucks on a BeagleBone Black. With a BeagleBone Black and a Mini USB cable, you have everything you need to create your first project: making the onboard LEDs blink. Don’t feel overwhelmed by all the accessories listed here, because you don’t need all of them right out of the gate. You may find that you already have most of these accessories on hand, so you may need to purchase only some of the accessories to complete your projects. USB A–to–Mini B cable: The BeagleBone comes with one Mini USB cable. This cable not only powers up your BeagleBone, but also enables you to connect your BeagleBone to your computer. microSD card: The Original BeagleBone doesn’t have any kind of internal memory, so you need a microSD card to install and run the operating system; the Original BeagleBone already comes with a microSD card. On the other hand, the BeagleBone Black Rev A and B have 2GB of built-in memory, and Rev C has 4GB. The operating system can be run on the built-in memory and so these boards don’t include a microSD card in their standard package. You must have a microSD card to install a new operating system or to update the existing one, however. Get a branded microSD card with at least 4GB of storage for your BeagleBone Black. microSD card adapter and writer: Most computers have a slot for SD cards, so you can insert your microSD card into a microSD card adapter and connect it to your computer. If your computer doesn’t have an SD card slot, you might consider buying an SD card writer. 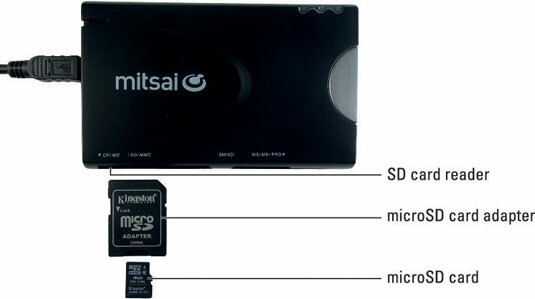 There are many different types of microSD cards and SD card writers. Generally, their prices are based on the speed at which data is written on them. Go for branded versions of both the writer and the card and get at least a class 4 microSD card. Ethernet cable: Connecting your BeagleBone to your router with an Ethernet cable enables you to install and update software; additionally, the BeagleBone is a great platform to create Internet-related projects. It also provides you an extra way to control your BeagleBone remotely. 5V DC power supply: The BeagleBone can be powered up with a Mini USB cable by just being connected to your computer, but if you want to use your BeagleBone at maximum performance, capability, and featuring lots of USB peripherals — and/or for portable applications —use the 5V barrel connector. The power adapter that’s required needs to provide 5V over a 5.5mm outer diameter and 2.1mm inner diameter. It must supply a minimum of 500 mA to power up your BeagleBone. A USB connection provides either 500 mA or 900 mA of current (depending on whether it is USB 2.0 or USB 3.0). This is generally enough to have a BeagleBone connected through Ethernet and powering several electrical components. However, if you connect many USB peripherals, you are advised to go for an external 1.2A to 2A power supply. Display: Most displays with an HDMI output work with the BeagleBone Black. You can also buy an LCD cape that’s specially designed to act as a display. Not all displays are compatible with the BeagleBone Black. Make sure that you carefully read the sidebar at the end of this chapter to find out more about compatible accessories. The Original BeagleBone doesn’t have a built-in Micro HDMI port. Worry not, though: You can still output image and sound with an LCD cape. HDMI–to–Micro HDMI cable: If you have a BeagleBone Black with an HDMI–to–Micro HDMI cable, you can output video and sound to a display. 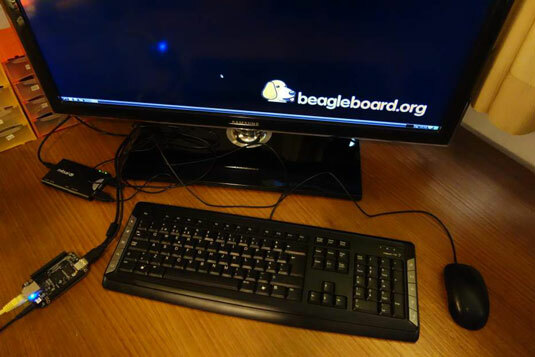 USB keyboard and mouse: Most standard USB keyboards and mice are compatible with the BeagleBone. Keep in mind, though, that the board has only a single USB host port, so you have to connect a USB hub if you want to add more than one peripheral. USB hub: The USB hub enables you to expand the number of USB ports on your BeagleBone. This accessory is essential if you want to have multiple peripherals connected at the same time. USB-to-TTL serial cable: If you have a BeagleBone Black, this cable could be useful to debug your BeagleBone Black during the booting process. The Original BeagleBone has this feature built in, so you don’t need the extra cable. Other cables: If your display doesn’t have an HDMI output, you may be able to use a Micro HDMI-to-VGA or Micro HDMI-to-DVI converter. That way, you can repurpose your old desktop display. Using converters for the Micro HDMI adds a whole other layer of incompatibilities. Case: The BeagleBone arrives without a case, and some people actually prefer that look and feel, but it’s important that your board stay away from static electricity, conductive metal, and liquids. It’s a piece of electronics, after all. The best way to protect your BeagleBone is with a case. Breadboard: Using a solderless breadboard is the best way to prototype. It’s really easy to use, as it doesn’t require any soldering. That means that you don’t make any permanent connections and can easily modify your circuit at any time. Multimeter: A multimeter is a useful device that measures many things related to electricity. Soldering iron: Solder is a metal that liquefies easily when heat is applied to it and quickly goes solid again the moment it’s exposed to air temperature. A soldering iron is used to melt solder to establish permanent metallic connections. Other components: Some projects use extra components such as LEDs, servos, motion sensors, and electrical wires.